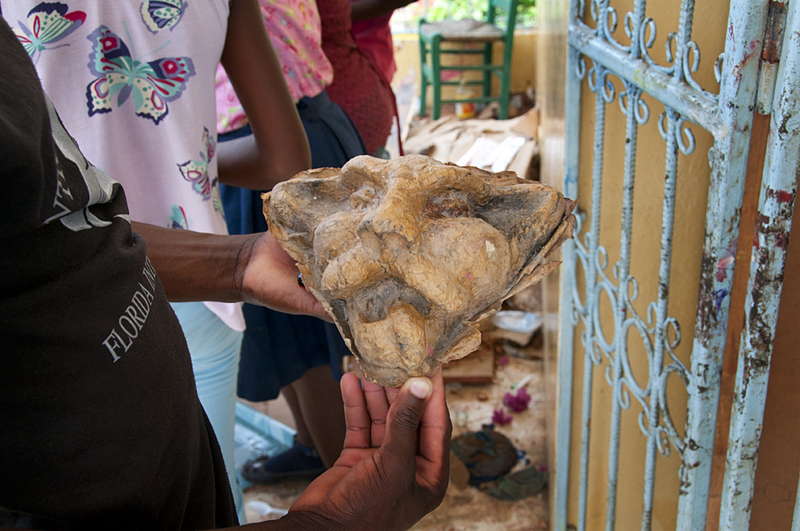 The Art Creation Foundation for Children in Jacmel, Haiti is alive and well! We have had a number of substantial grants over the past year, which have paid for the rent on our building and our food program, but we are facing a shortfall this summer for general operating expenses and for educational expenses (school fees, books, uniforms, shoes, backpacks) for our children when the new school year begins in August. Any help you can give us will be greatly appreciated! Here is a link to a new video that outlines our services and the children who are part of our program. 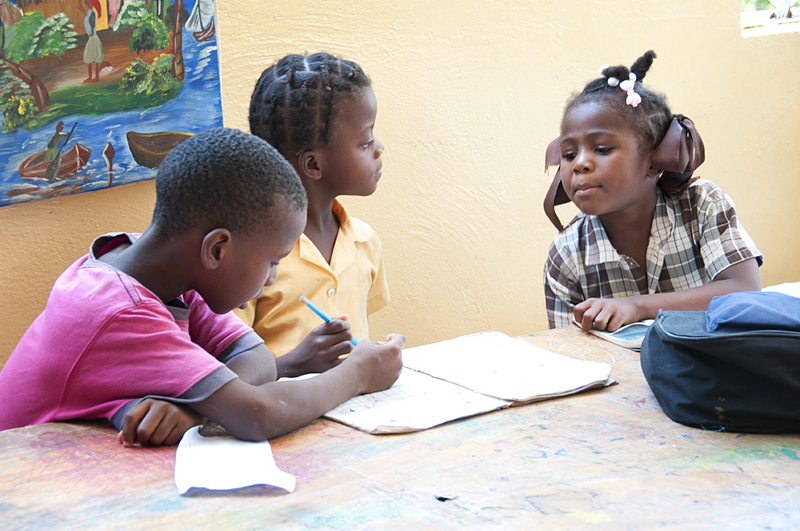 In it, you can see some of the work created by the children in Jacmel and understand exactly how the dollars you donate are used by ACFFC. 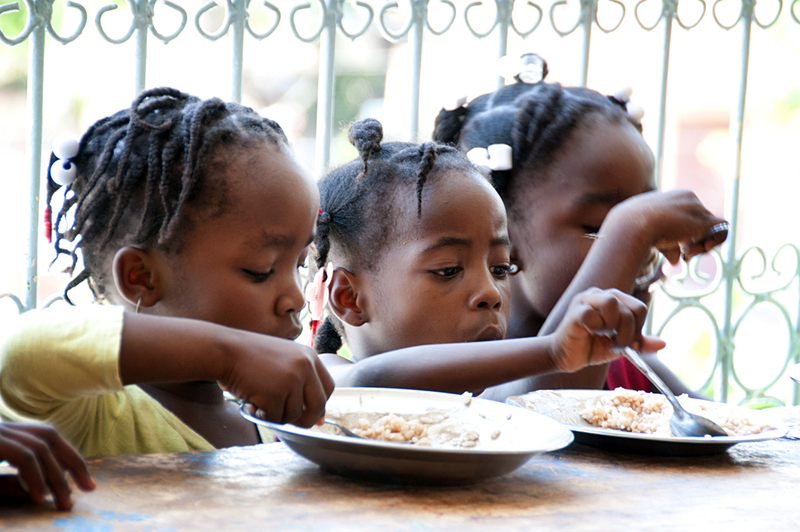 I urge you to help us help our children achieve a better life in a difficult country. 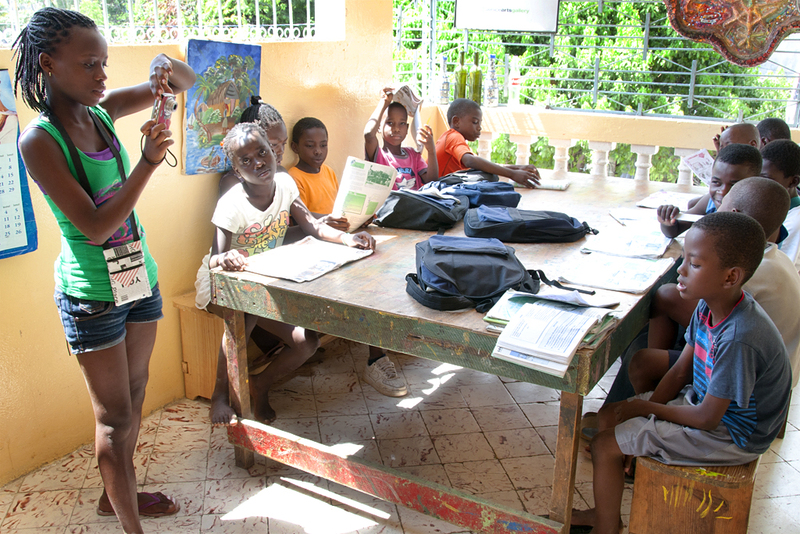 We are proud in the knowledge that we are helping these children learn the skills that can help them to change their lives. Bruno Rene has moved on to a position as art instructor on the staff of ACFFC. He recently took part in a countrywide painting competition for Sogebank where he rose up through the ranks. 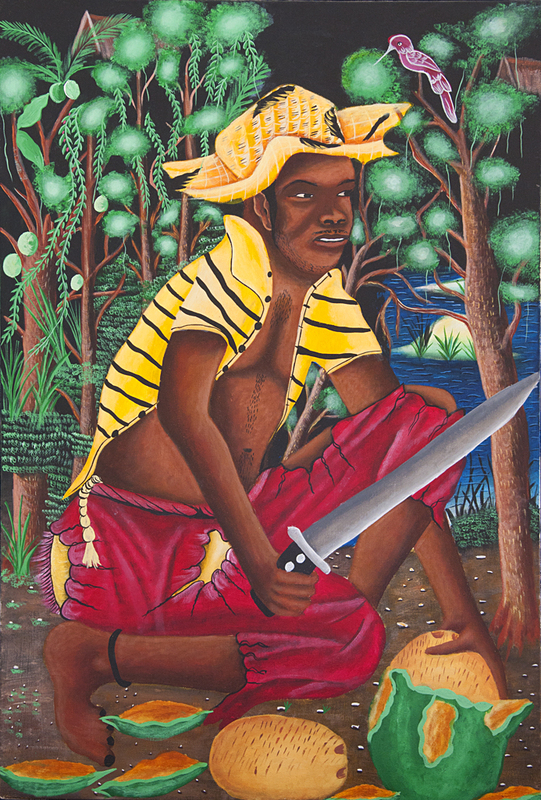 He was a finalist to represent South East Haiti, one of three. 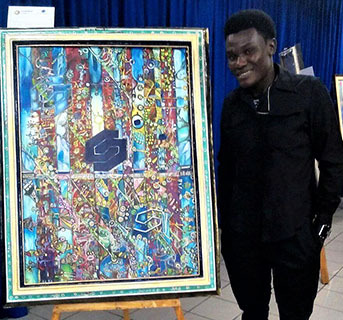 He then traveled to Port Au Prince to compete with artists from around the country, and ultimately won an honorable mention and an award of 75000 HTG (about $1200 US). 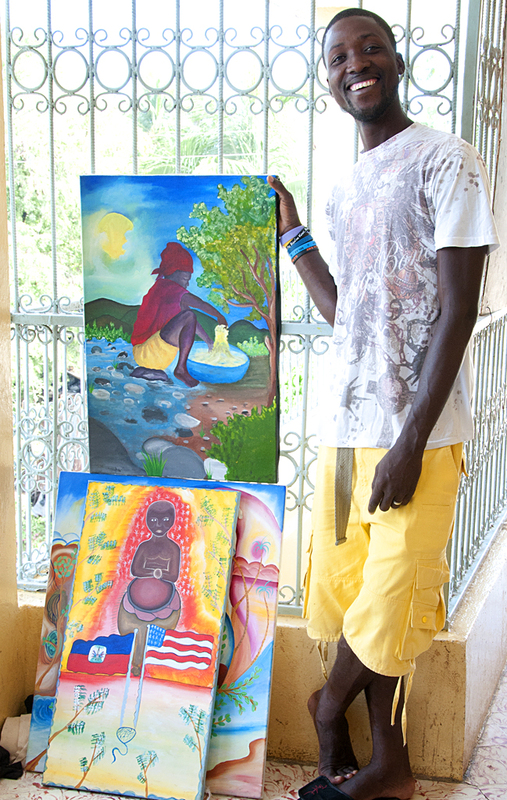 His work is currently for sale at a premier local art gallery in Jacmel where he has sold some of his larger pieces. 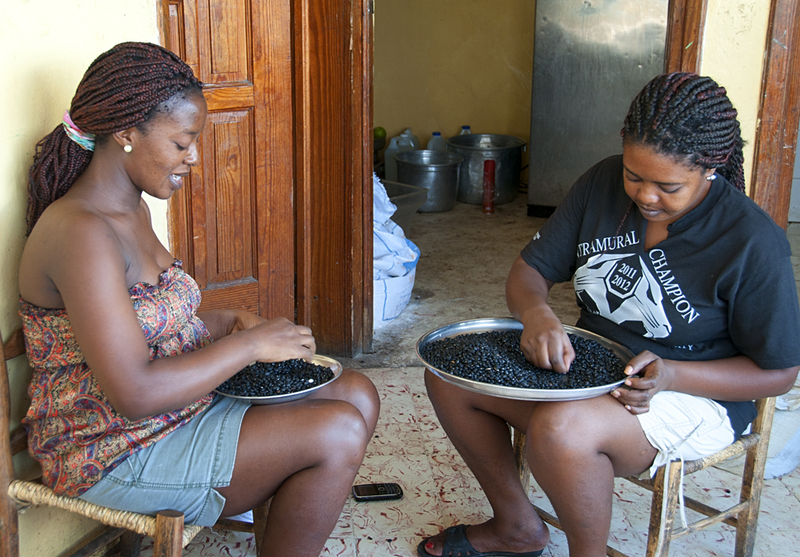 Michou Jouissant is now leader of the Mosaic Product Team – an important part of the ACFFC program. She is charged with team management, product development and quality control. A natural leader, she is the highest paid student intern and is performing work that will lead to jobs in the private sector in the future. 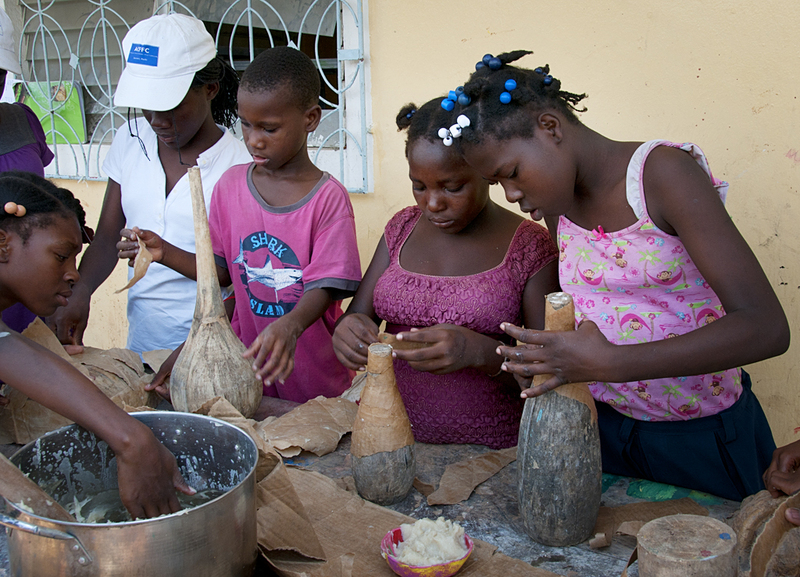 The Haitian culture is very difficult for women with aspirations to move beyond service and caretaker roles. 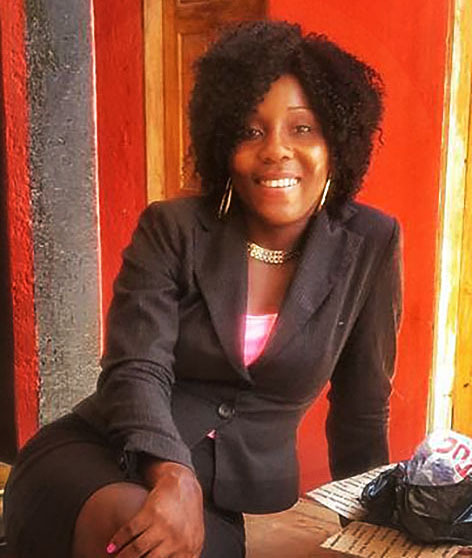 Michou has benefited from a special program within ACFFC devoted to the empowerment of our young women, giving them a voice and helping to build their confidence and self-esteem where they learn to speak up and take on leadership roles. Fedno Lubin has two more years in high school, where he is a star student and has learned fluency in English. He is a part-time student intern at the foundation, and the official ACFFC photographer. 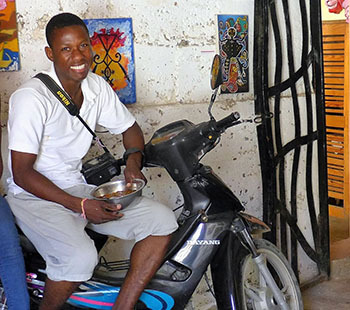 He has created his own photography business and is in demand as a photographer of communions, weddings and baptisms in the Jacmel area, and has developed a line of postcards that he sells to hotels and tourists. Every penny you donate will be used with care. Thanking you in advance! 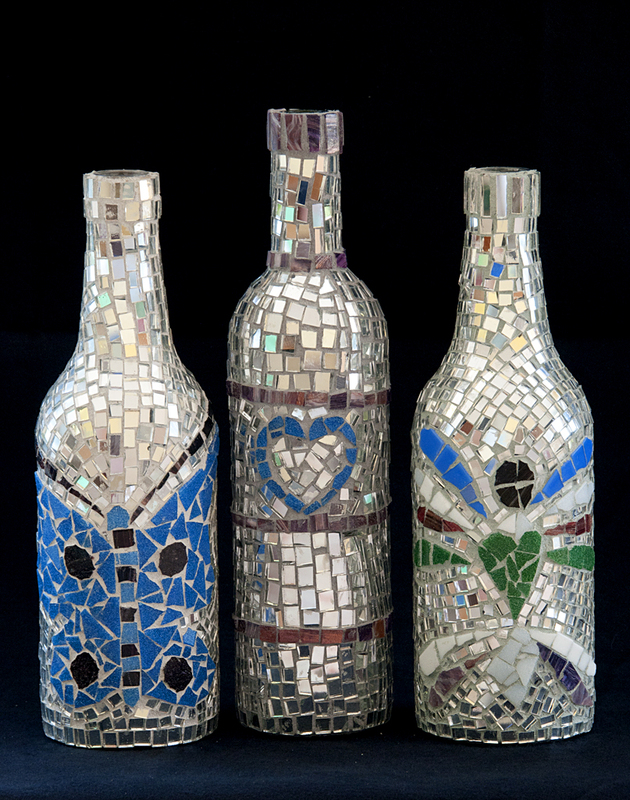 Mosaics are used to create vases out of bottles. Another shot of the photography group. Students doing homework after school. Group working on papier mache projects. 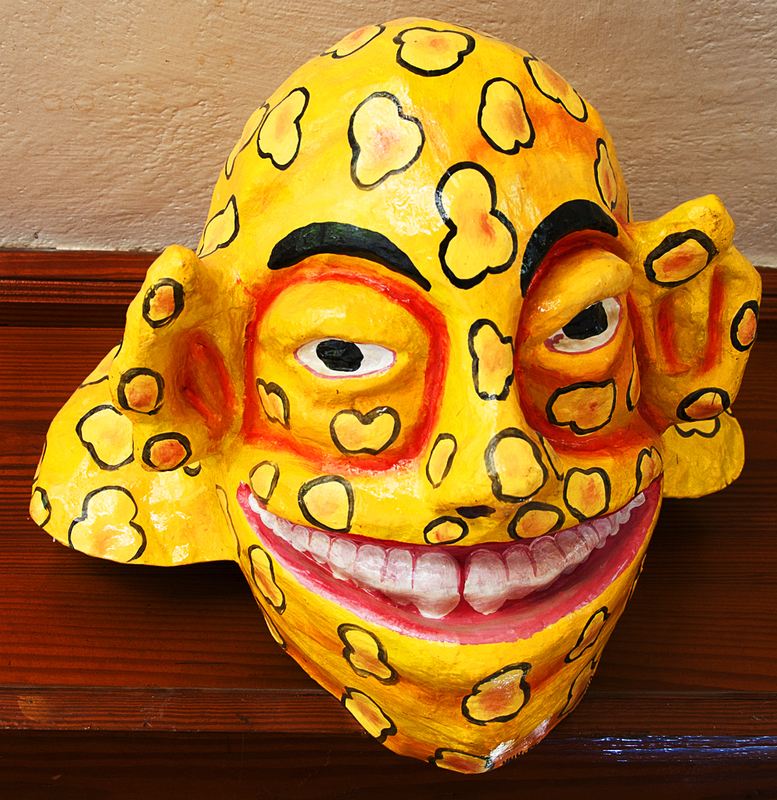 Paper can be glued to a mask base. The showroom in our new building. 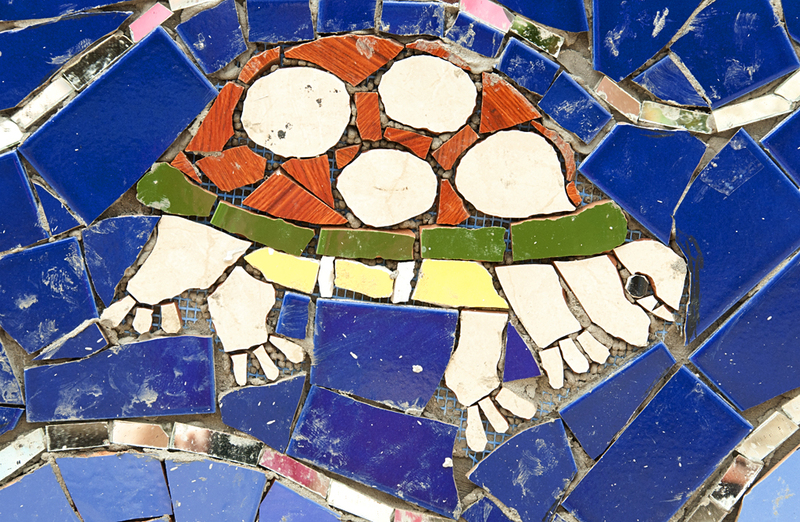 A mosaic design begins with a sketch. 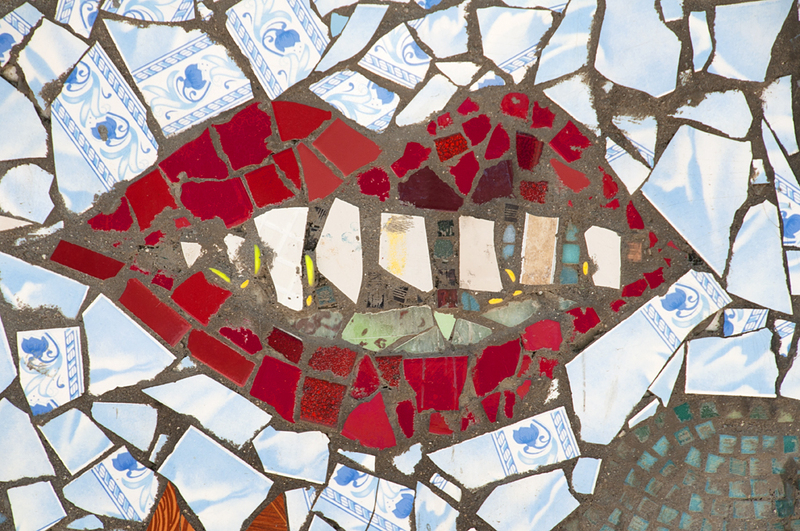 The mosaic pieces are cut and glued to mesh. The tiles are cemented to the wall. Grout is added when the wall is complete. 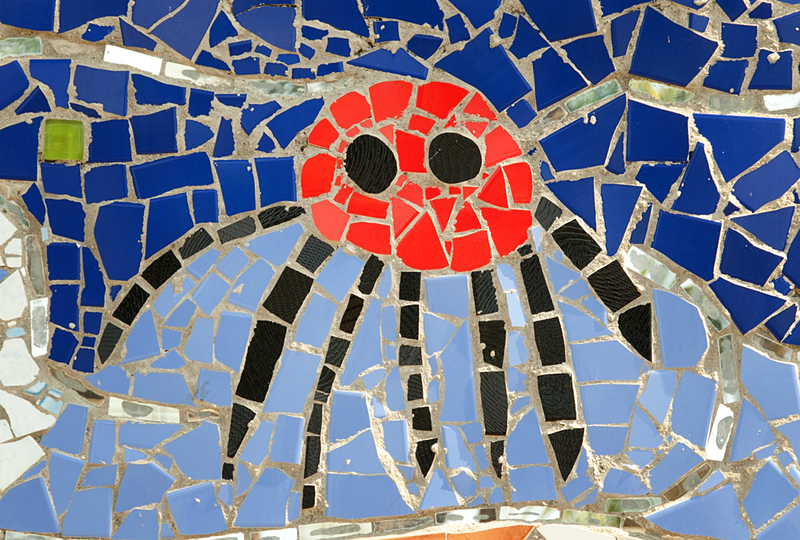 You can see how the children’s imagination and skills have evolved in these images. And they are so proud of their work! ACFFC will celebrate its tenth anniversary as a 501c3 corporation later this year. This milestone is the perfect time for us to reflect on the amazing achievements of the past decade and move ahead on plans for the future. A future that looks very promising for the Art Creation Foundation for Children youth! 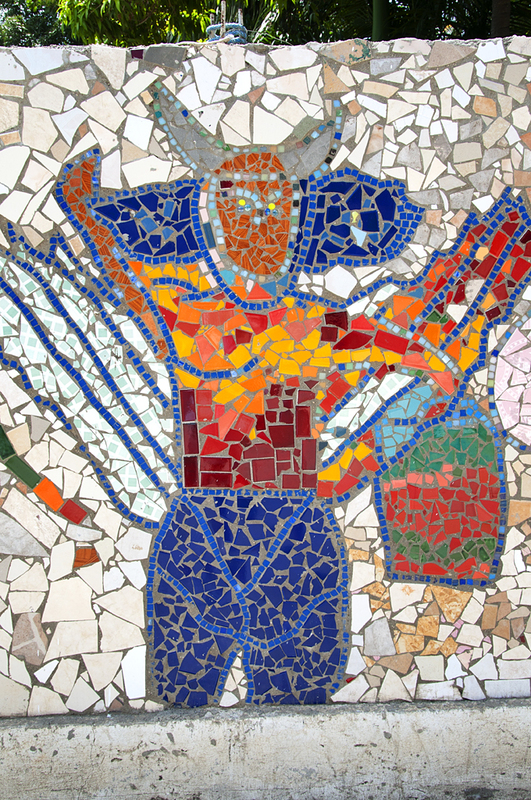 The Art Creation Foundation for Children began to work in mosaics after the 2010 earthquake when Laurel True arrived from Global Mosaic Projects to work with the group. Together they created the Tree of Life as a memorial to lives lost and to hopes for the future. Here is a link to last year’s post. 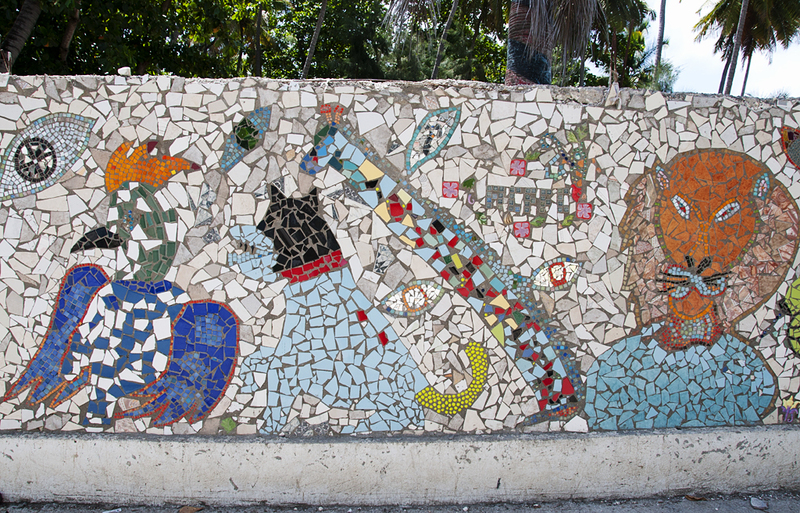 The wall was a great success and immediately became a source of great pride and a gathering place in the city of Jacmel. 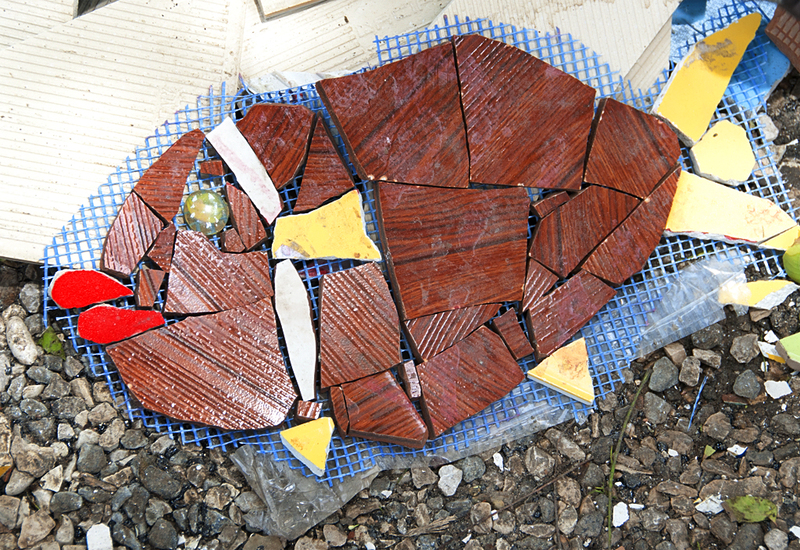 And the children loved making the mosaics. 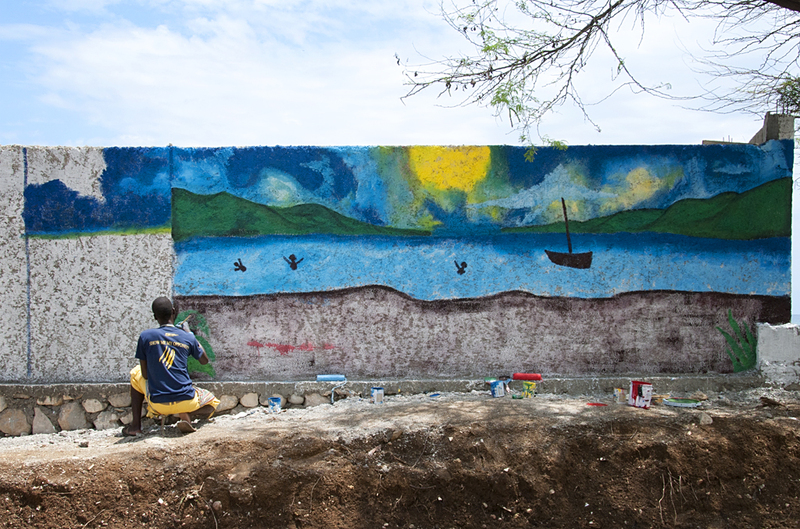 Over the past year, panel by panel, they completed the wall along Congo Plage (beach). A grant from ARCADES propelled their abilities to a new level. 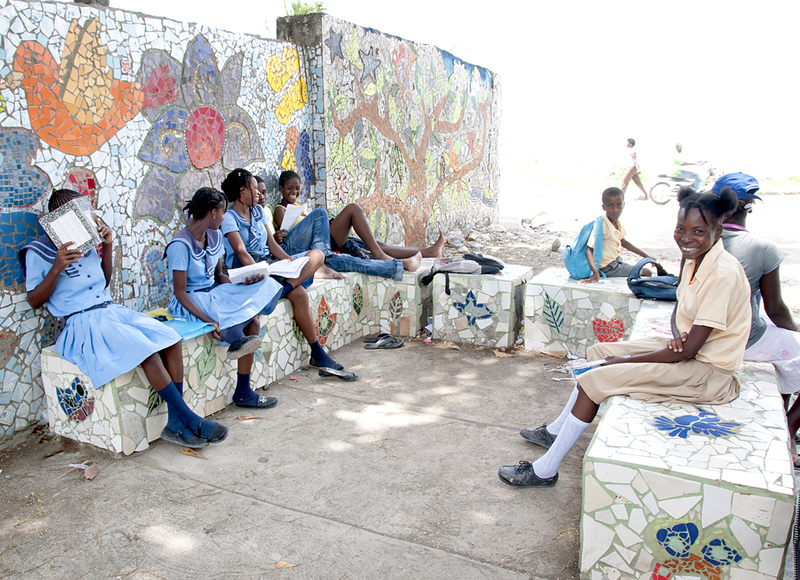 Under this grant, wonderful walls and benches have been created all over the city. 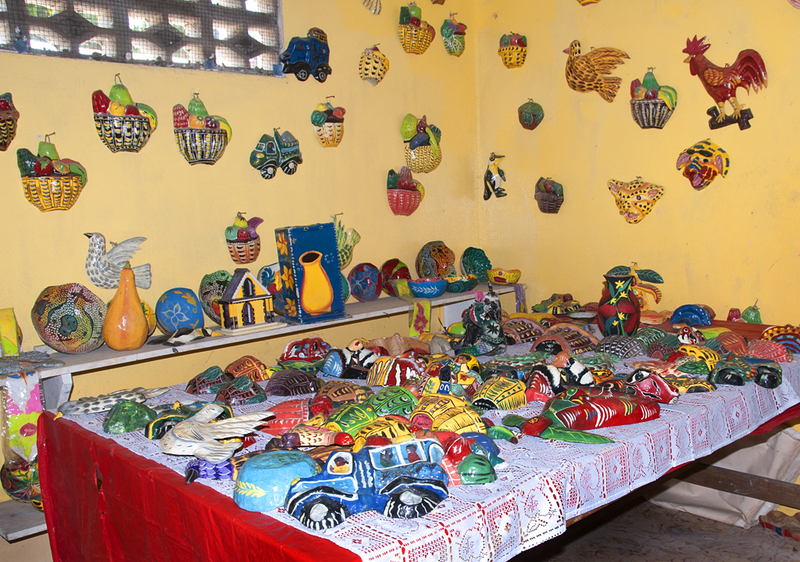 Because of the impact that these beautiful projects had on the various neighborhoods, ACFFC was given commissions by the Tourism Office in Jacmel, and by individuals and businesses as well. 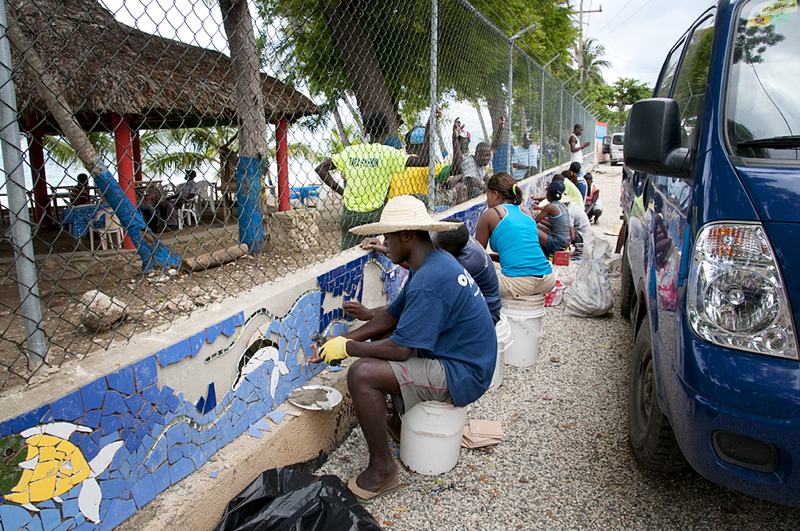 On this trip, I ended working with the kids on a large mosaic commission at Raymond Les Bains, a beautiful beach just outside the city. 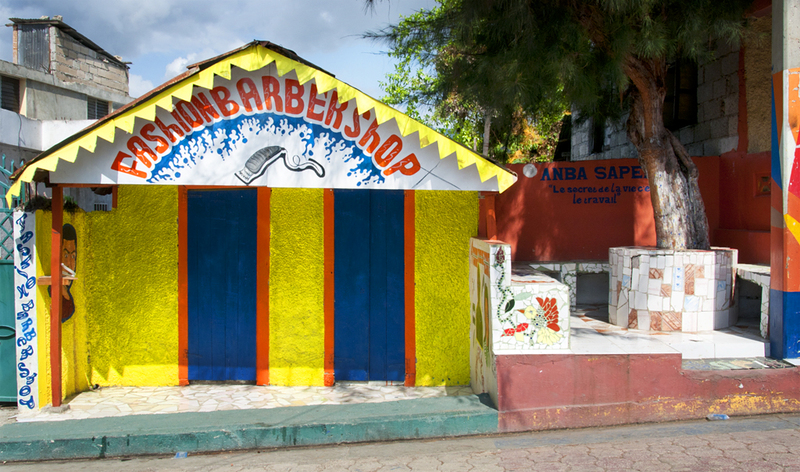 This work was requested by the Department of Tourism in Jacmel and the Ministry of Tourism of the government of Haiti. 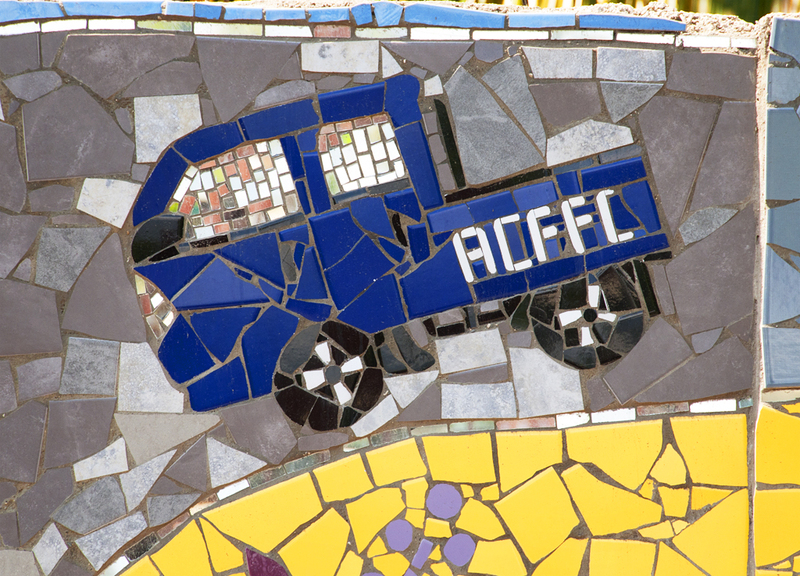 Some of the funds received through these grants and commissions pay for materials and contribute to keeping ACFFC operating. But a portion of the funds are deposited in individual bank accounts for the youth 16 and older. 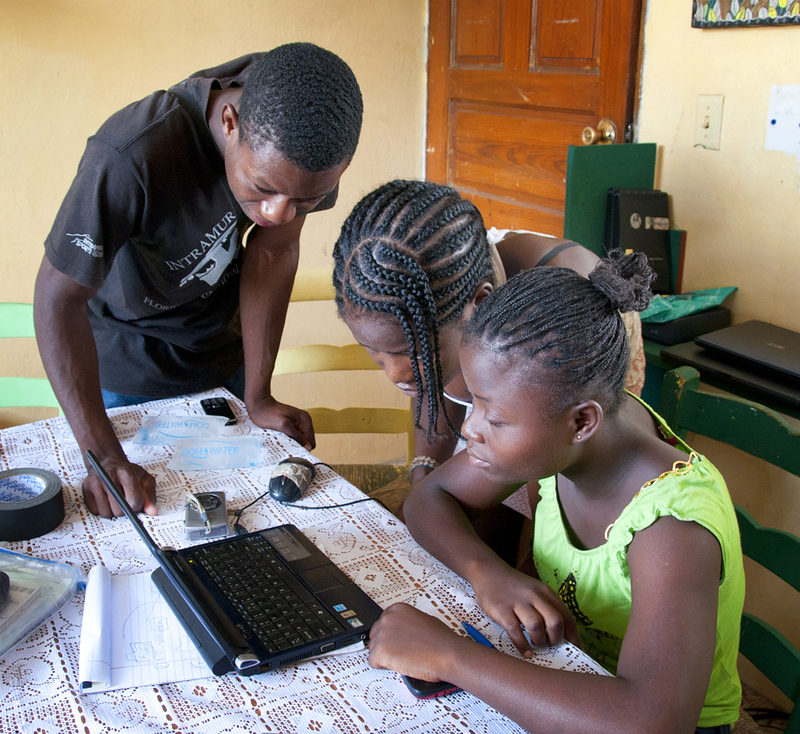 These teens receive a stipend for participation and are learning to manage their money. Financial literacy is a goal of the foundation. Each child can give some of his/her money to his/her family, can use some for immediate personal needs, and must save some for the future. 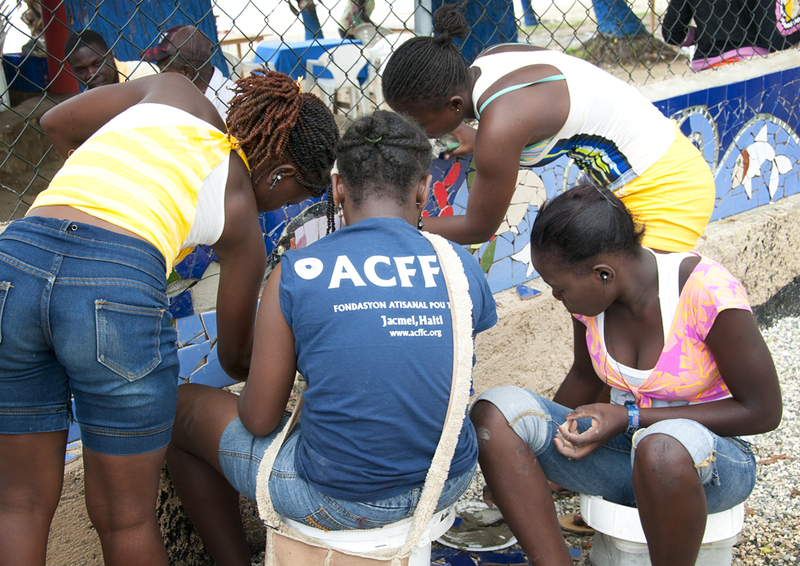 As well, a portion is allocated to families who the youth feel have significant need, whether or not a part of ACFFC. 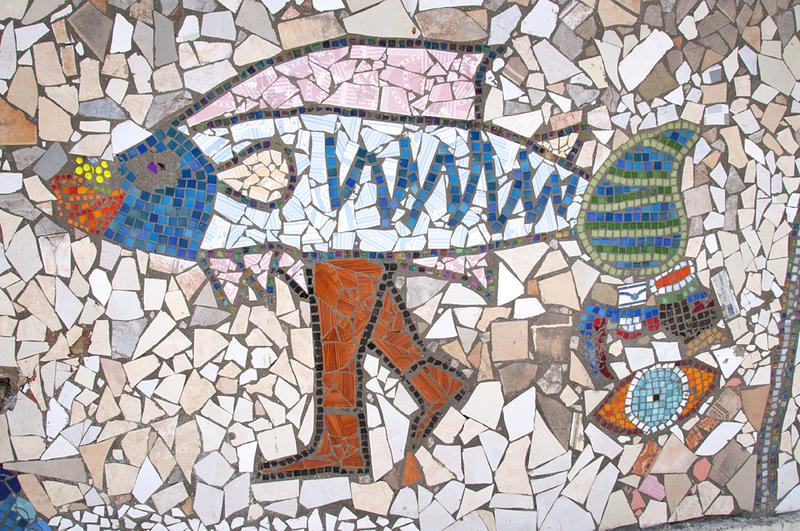 The younger children, who are beginning to learn skills in mosaics, as in papier mache, are helpers. Some funds are set aside for their future. 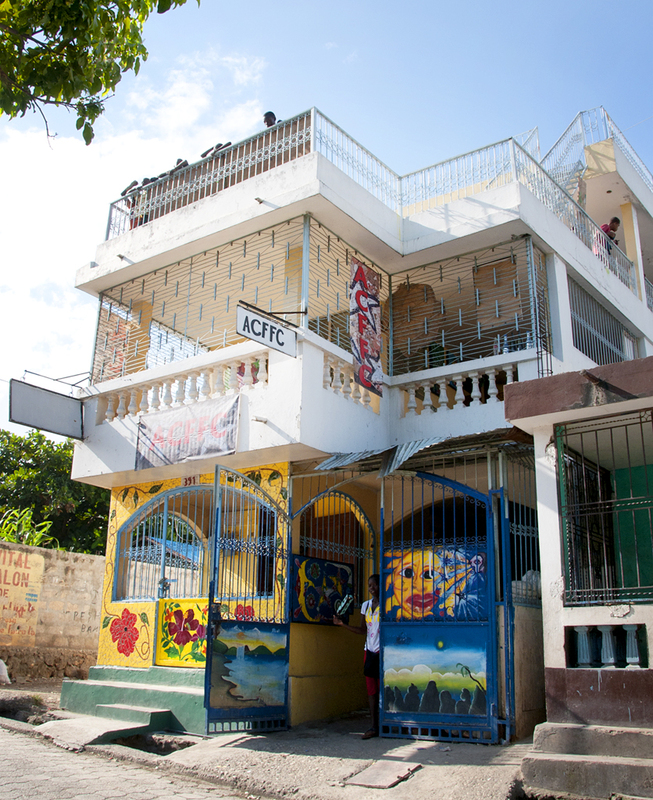 In this way, an ongoing public art project that is so creative, also contributes to personal growth, financial competency, plans and goals for the future for these ACFFC youth, just as it contributes to aesthetics and pride in Jacmel among resident. Amazing achievement. Papouche is a gentle giant. He was one of the first people I met on my visit to the Art Creation Foundation for Children last year, and was a tremendous help to me this year. His was a difficult upbringing in Port au Prince in a home for street children, where Jen Pantaleon of Zanmi Lakay first met him and began to work with him in 1997. Even in that environment, Papouche made many friends because of his integrity, his respect for himself and others, and his wonderful smile. In 2000 when the group home closed Papouche was back on the street. Jen was glad to find him again the following year at yet another group home. He was able to take part in Zanmi Lakay programs learning carpentry, and was sent back to school. He is very intelligent. He is also a fabulous dancer. 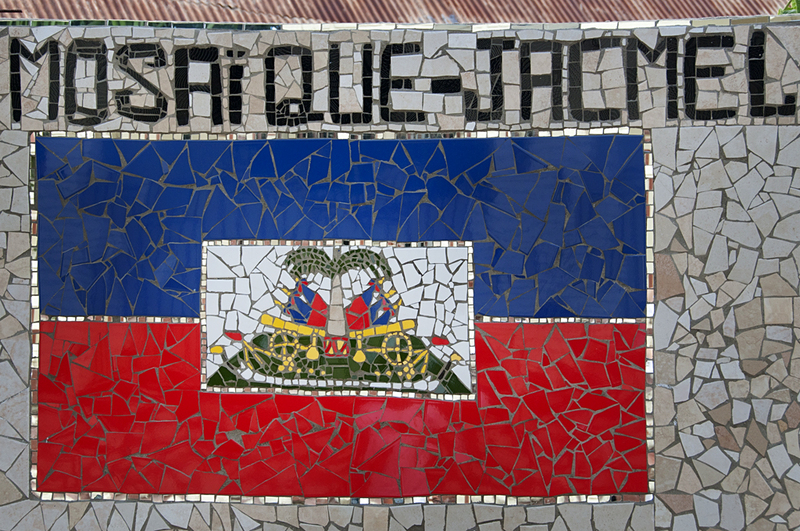 After the house in Port au Prince where he was living collapsed in the earthquake, Papouche was invited to move to Jacmel and become a part of the Art Creation Foundation for Children. He is older than most of the youth, but was not yet able to earn enough to live on his own. It was not an easy transition, but he has blossomed at the foundation. and on a large scale. He has used his carpentry skills to rebuild homes for ACFFC families, and to great advantage in the new building. These are cubicles he has constructed in the new computer room. 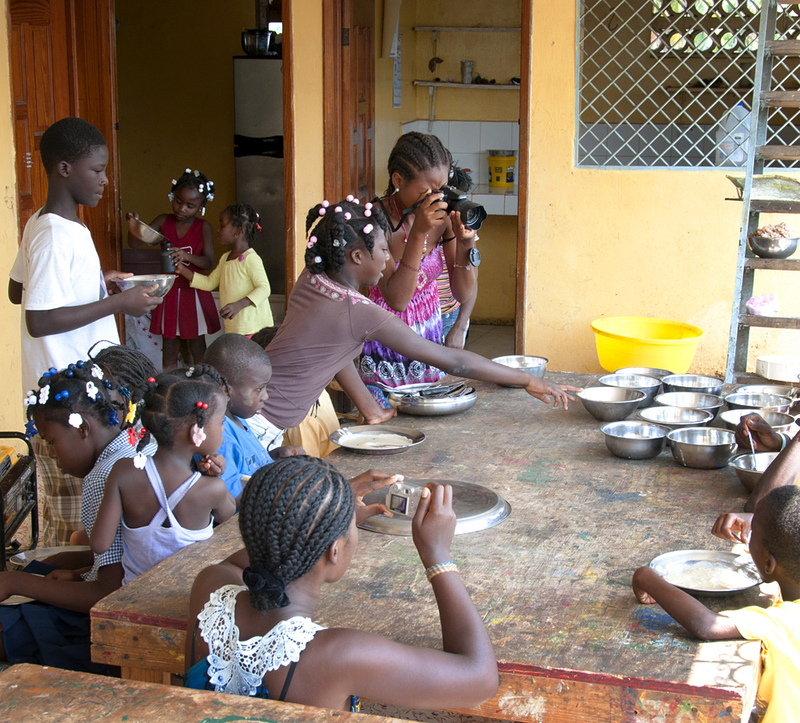 Papouche is a leader with the mosaic team and visiting groups, and works on assignments for Zanmi Lakat. 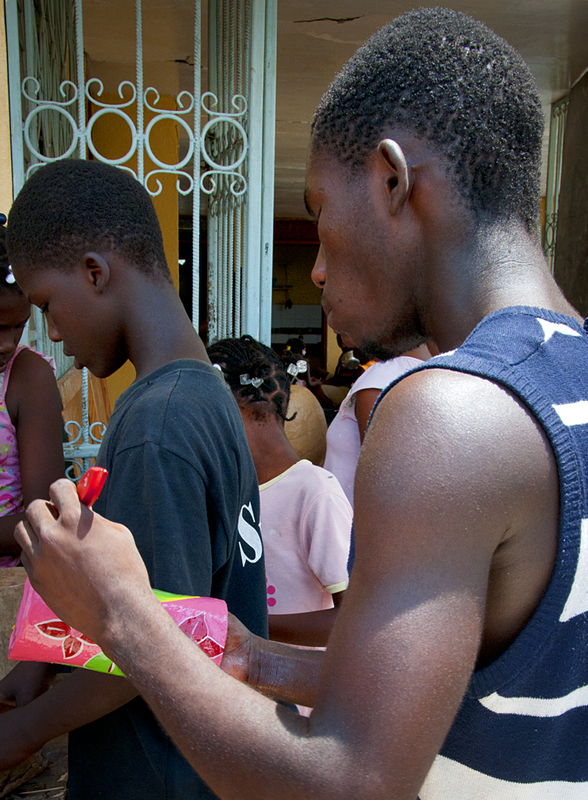 He is earning a salary and respect, making friends, and his life has changed dramatically. He has worked hard and, despite the obstacles, is making a productive and satisfying life for himself. He is a wonderful role model for the younger children! 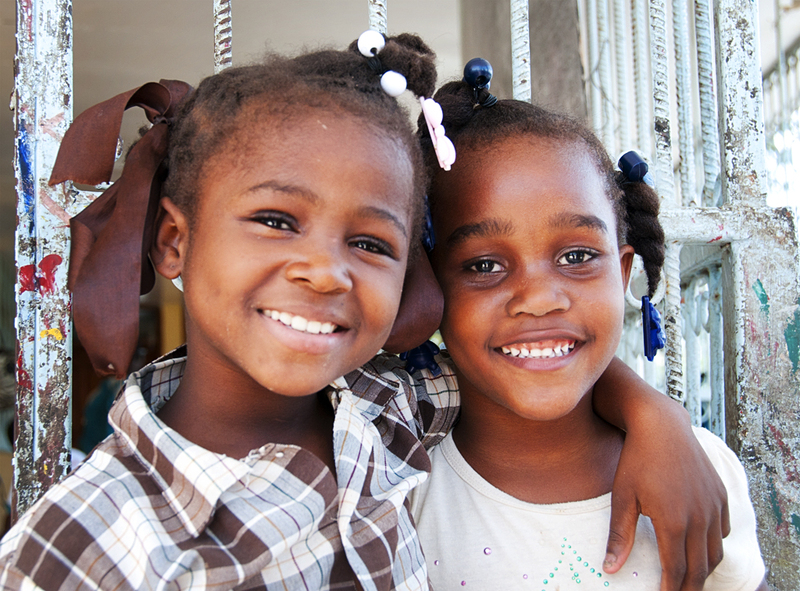 Haiti is a male-dominated Society. 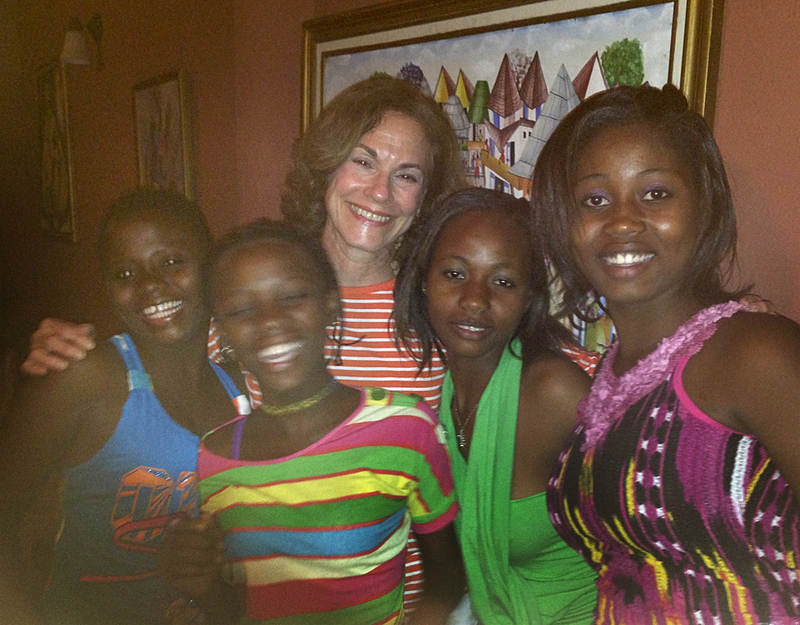 Ergo, during my 2013 trip to the Art Creation Foundation for Children in Jacmel, Judy asked me to host a dinner for three of the teenage girls that have shown leadership ability. Nynedia and Sheldine, sisters, were working with me in the photography workshop. Michou, who is a leader of the mosaic product team also joined us. We didn’t take photos in the restaurant, but here is a link to a beautiful short film about her prior work in photography made by Kuba, a colleague of Jen and Guy Pantaleon of Zanmi Lakay. Ironically, also joining us were Georges and Vladimir, the two male directors of the Foundation in Haiti, who were needed to translate. To their credit, they were not intimidated! The story I shared: I resolved upon graduating from college, and opting not to continue to graduate school, to find an interesting job that did not involve typing for others. This, for a woman in 1968, was easier said than done. I was a polite person, so I ended up taking a lot of typing tests for a lot of jobs that I would never take. Finally, I ended up as a researcher at WNET, the public television station in New York. That led to a job with a film company as a production assistant, then production manager and finally, producer. I had a lot of challenges and adventures along the way. There were very very few women doing those jobs at that time. I had to fight for recognition, for assignments and for equal salary. I recounted some of these situations and how I managed to achieve my objectives. The girls were fascinated. I even told them stories of my grandmother’s childhood in the early 1900’s and how she managed, as an immigrant child in New York, to learn English with no accent, and then how her father forced her to quit school in 8th grade. She took, and then after a few days quit, a menial job in a garment factory, put her hair up to look older, and through a neighbor got a job in an office. She realized that bookkeeping would not be very difficult for her, and used her first paycheck to enroll in a bookkeeping class. Her father almost threw her out for not bringing him the money. Within a year she made more money than he did. Later, she and my grandfather built a business of their own. She was a 50% partner, which also involved a struggle. 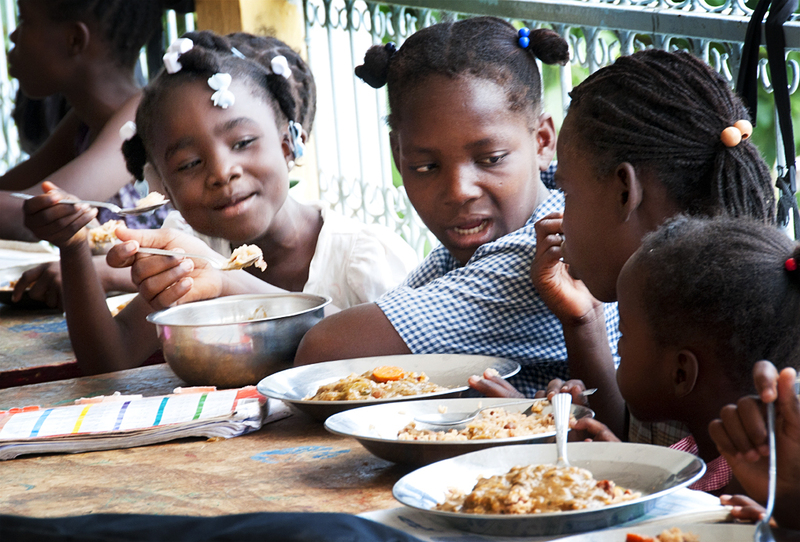 This reminded the girls of life in Haiti. 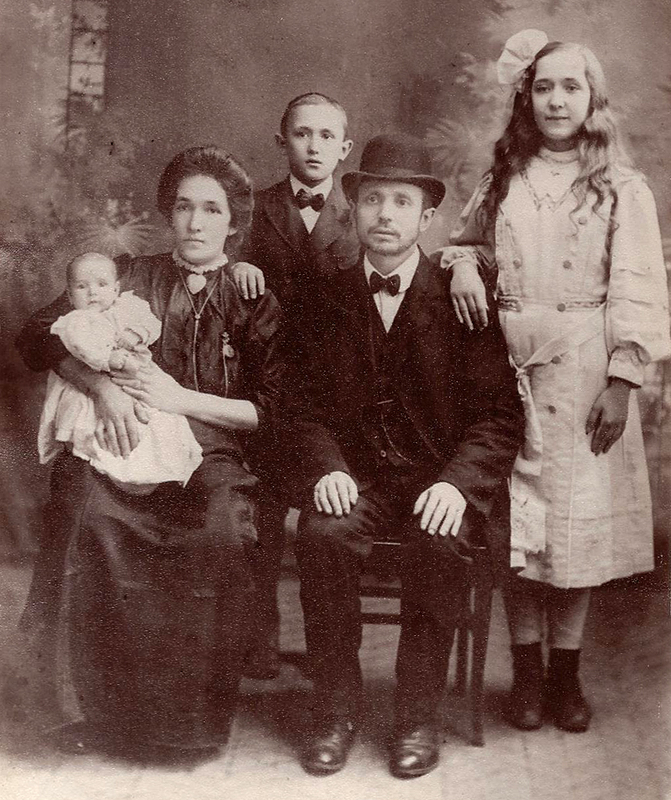 My grandmother is standing on the right. The point of the discussion: You can’t be intimidated when you have a goal. Especially if you are a woman! The girls had many questions about whether I had boyfriends, when I married, had children, etc. We all agreed that life is complicated, but that you have to believe in yourself. 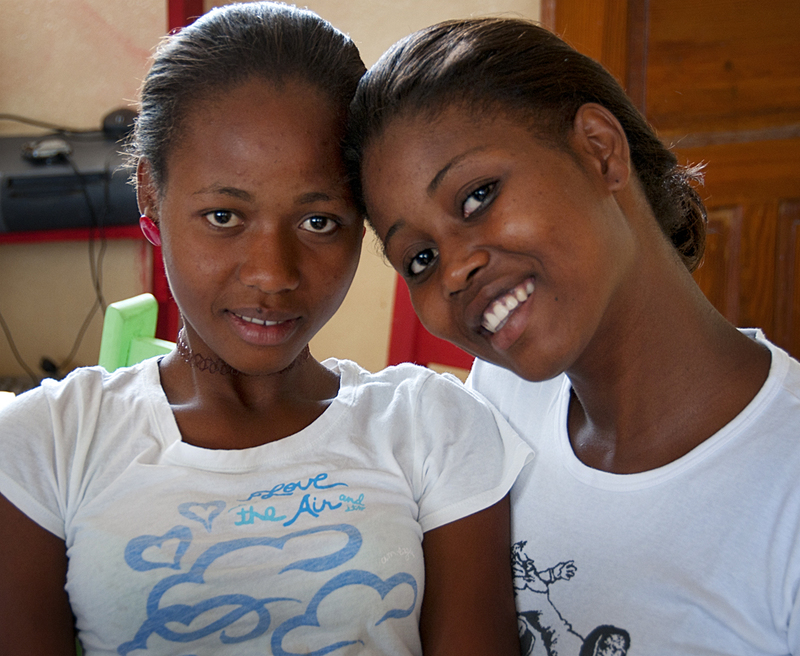 These young women are future leaders in Haiti. Wouldn’t it be wonderful if one of them could one day head the Foundation in Haiti and be a role model for the next generation? 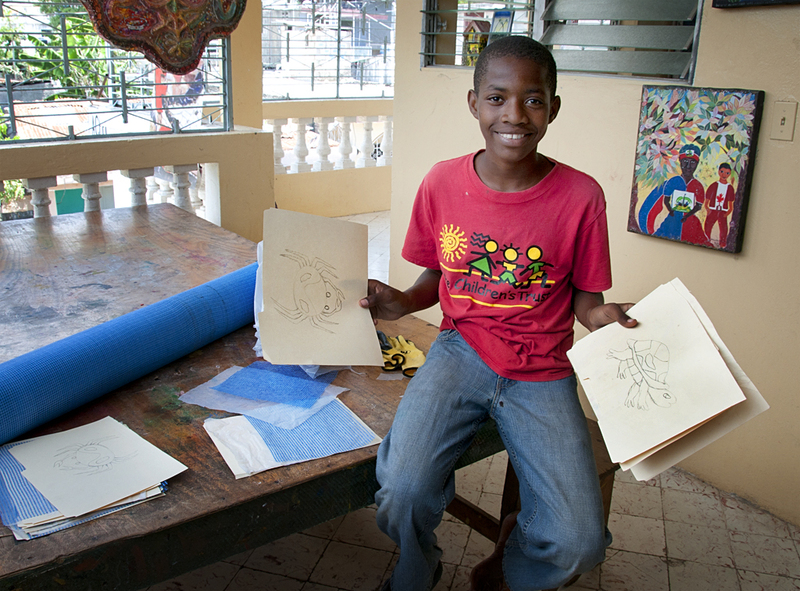 It was great to be back in Jacmel to work with teens at the Art Creation Foundation for Children! 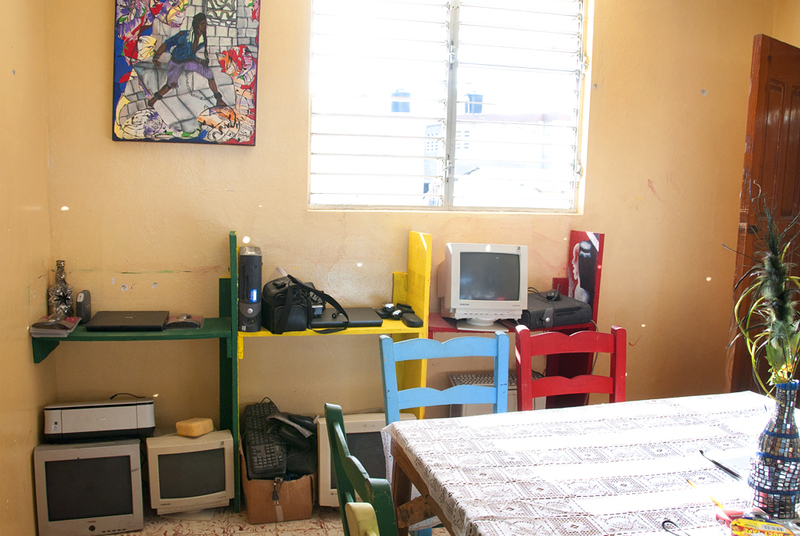 There have been so many changes – the kids have improved in both language skills and photography, and the foundation has moved to a marvelous new building. By the time I got there, everything had been moved and the families of the children all pitched in to paint rooms. 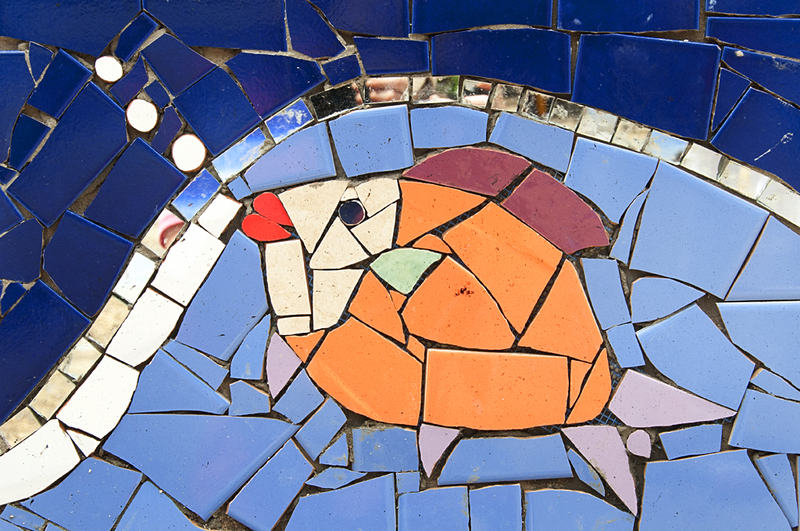 The kids installed mosaics on the front. Beautiful and welcoming! There are separate rooms for a library, computers, homework review, art projects and an efficient kitchen. The eating area is bright and airy. And the entire building buzzes with activity. Each morning I photographed various subjects needed for the new ACFFC website designed by another board member. And three afternoons I worked with the kids. The group this year consisted of 5 girls and one boy, Fedno. I had worked with all but one last year. Everyone loved using the newer cameras sent to them by my photographer friends. We had three specific goals: Tell a story – with establishing shot, action and close-ups. Move your images onto the computer – make a file, name it in a consistent manner ( name, date, what it is) and put the photographs into the file. Edit. Chose the best 3 photographs. Don’t include several that are similar. The group of 6 divided into three pairs and took 30 minutes to shoot an activity: chosen were food preparation, homework review and a local business. The challenges began when we looked at the images. The photographs were uniformly good. But only two of the kids had any idea of how to create a folder or how to name it. I had not realized that there are NO computers used in their schools. Fortunately, five laptops had just arrived and computer work areas have been built into the new computer room. (Computer classes will begin in a couple of weeks.) Meanwhile, four of the kids had never typed, did not know how to capitalize a letter, make an underscore, or where the letters are on the keyboard. That you can use two hands. We spent the next two afternoons practicing these skills, with those who knew how teaching those who did not. We then chose the best 3 photographs for each person and discussed editing and organizing. A more cerebral exercise than last year, when we used cool new backgrounds to photograph artwork, but of tremendous value in the long run. 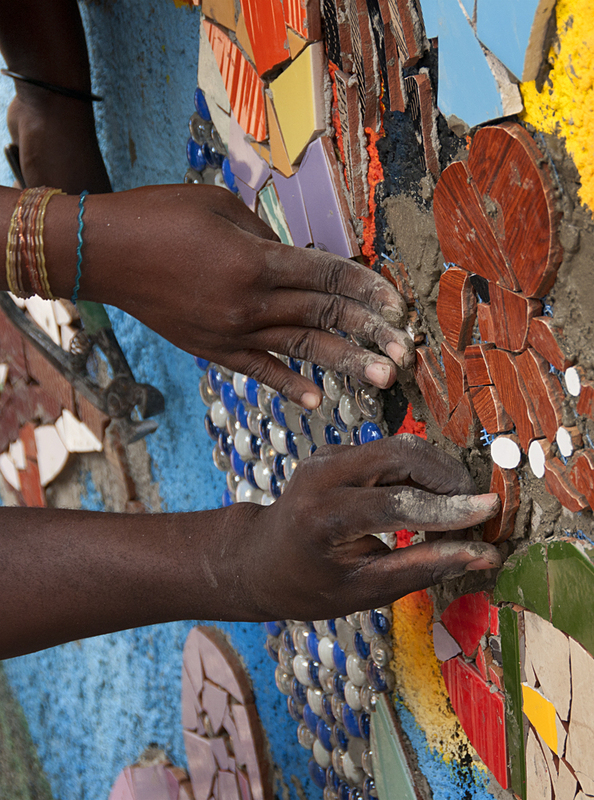 On the last day, a Saturday, the whole group had to work on a wonderful long mosaic wall commissioned by the city of Jacmel, so I photographed the work and then worked along with the kids – great fun!! Later, in the evening, we went out for a farewell dinner. I will miss them! 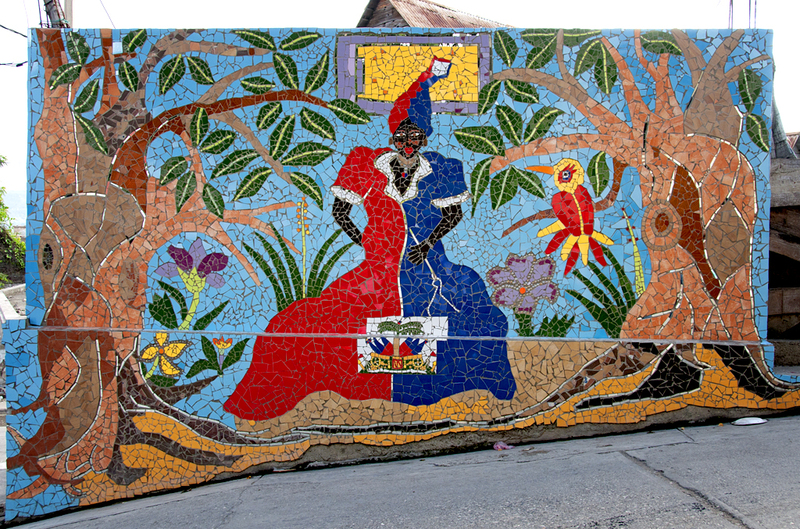 There is a special wall in Jacmel, Haiti. 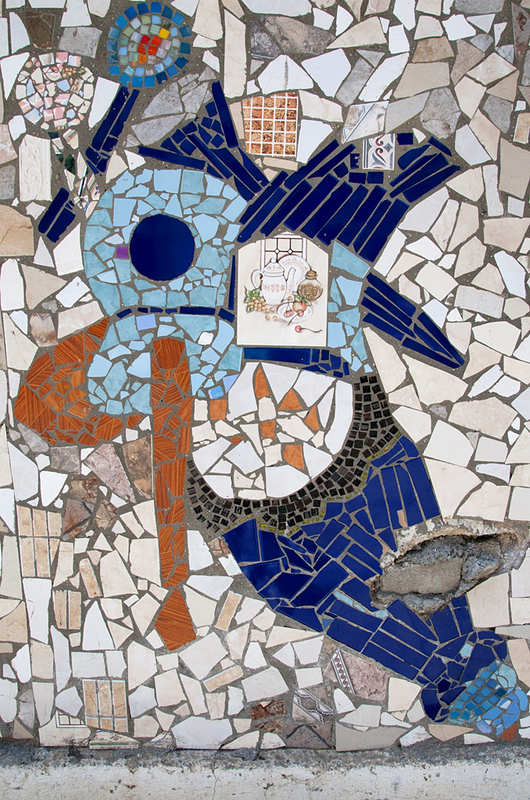 It was built by the children from the Art Creation Foundation for Children. 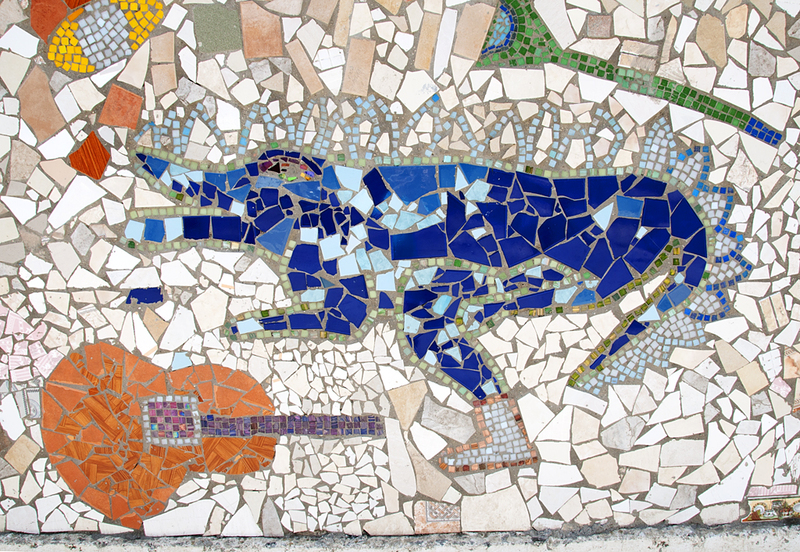 Shortly after the 2010 earthquake, Laurel True contacted Judy Hoffman with the wish to create a mosaic art project with the children of the Art Creation Foundation for Children that would be a lasting memorial to those lost and also a celebration of what the future could be. 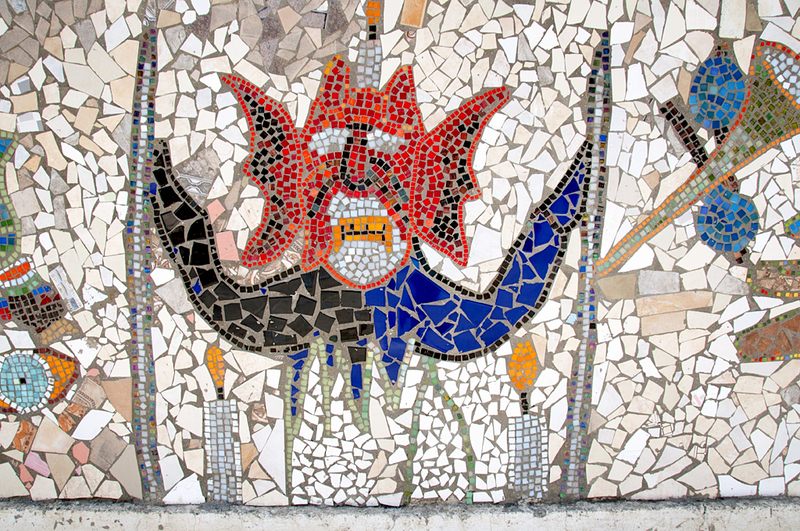 Laurel, a well-known mosaic artist, suggested a wall installation. 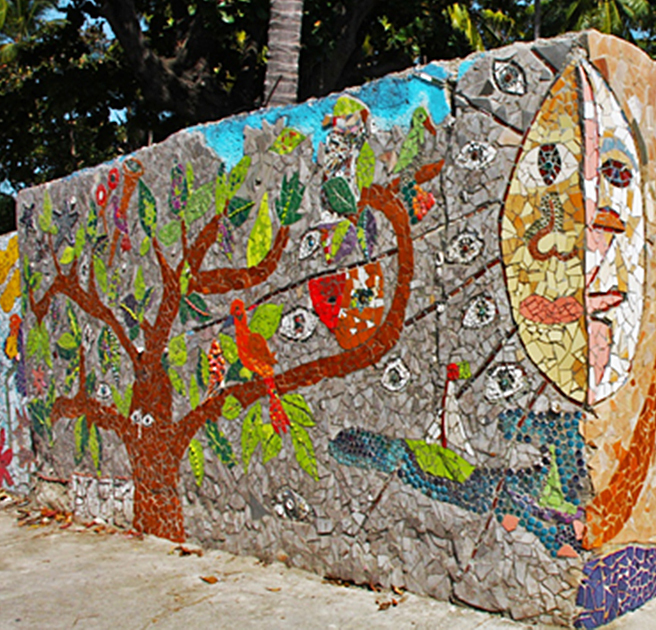 Permission was obtained from the then-Mayor and now Senator Edo Zenny to cover a section of a cement wall facing the ocean. 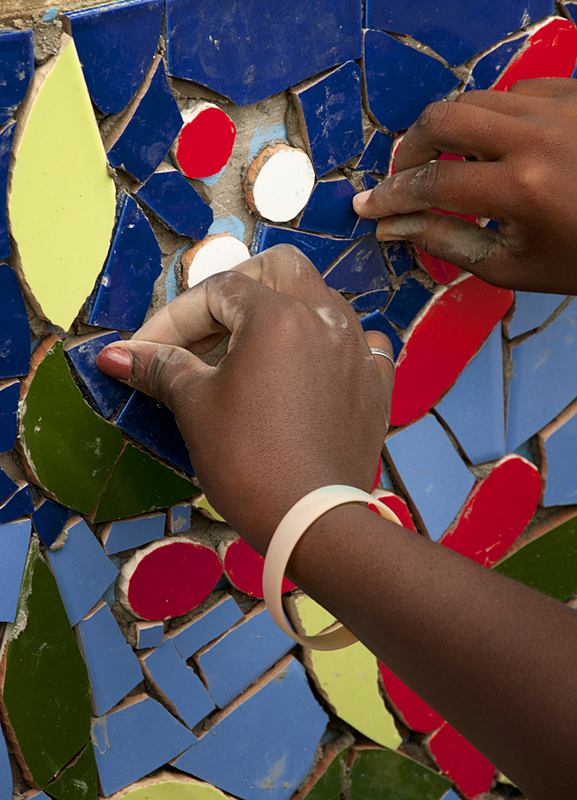 Laurel raised funds through Kickstarter, and with Erin Rogers working as her assistant, brought bags of mosaic tile to Jacmel and taught the kids what to do. 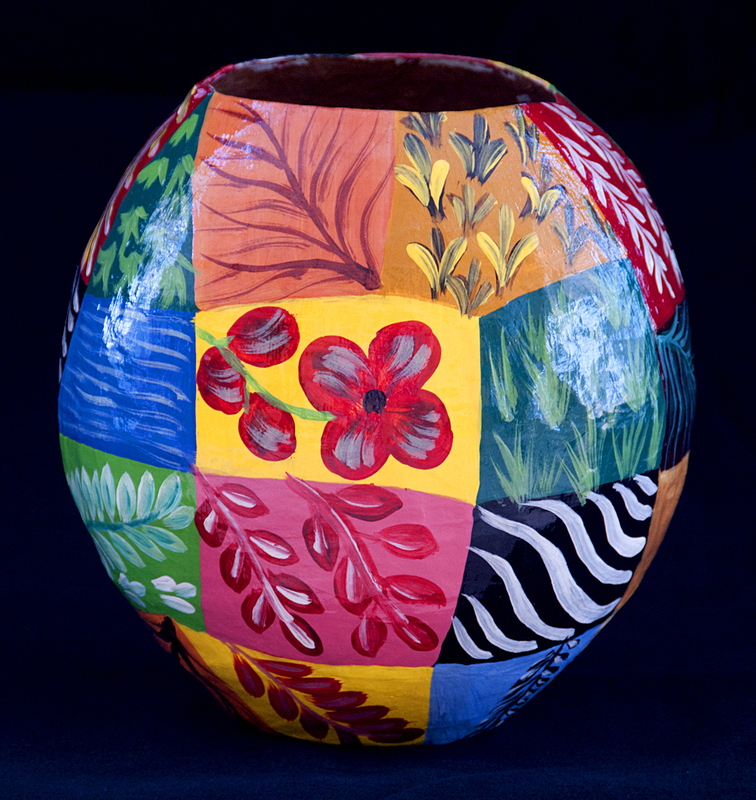 The designs were created as a collaborative effort by the children. The initial design was a Tree of Life. The kids sketched designs on the actual cement with chalk. All were amazed at how quickly they absorbed the techniques and put them into action. Within days the tiles were cemented in place and grouted. Here is Judy’s photo of the inaugural memorial ceremony. 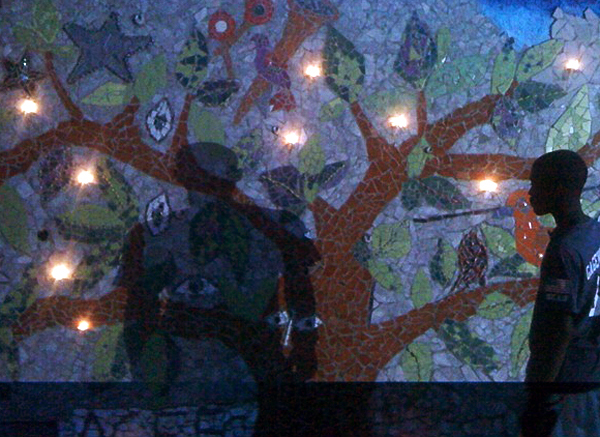 The Tree of Life was followed by La Sirene on a section of the wall directly facing the sea. 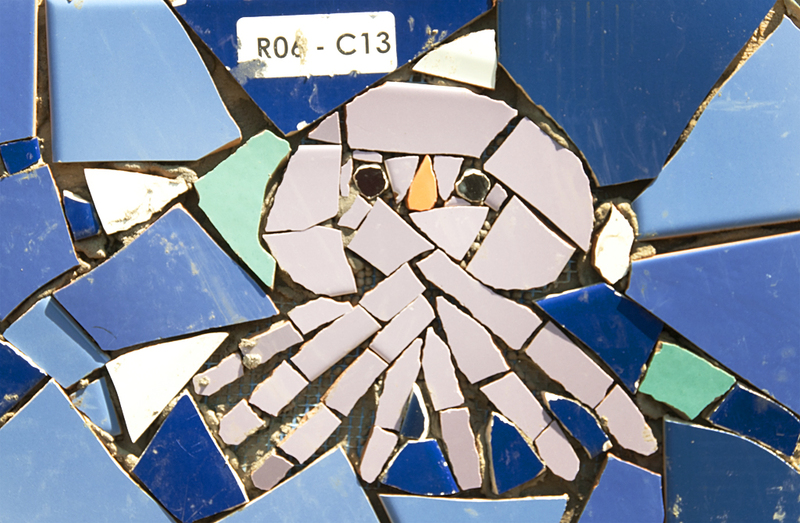 After Laurel departed, many more tiles were donated and the children continued creating wonderful images. 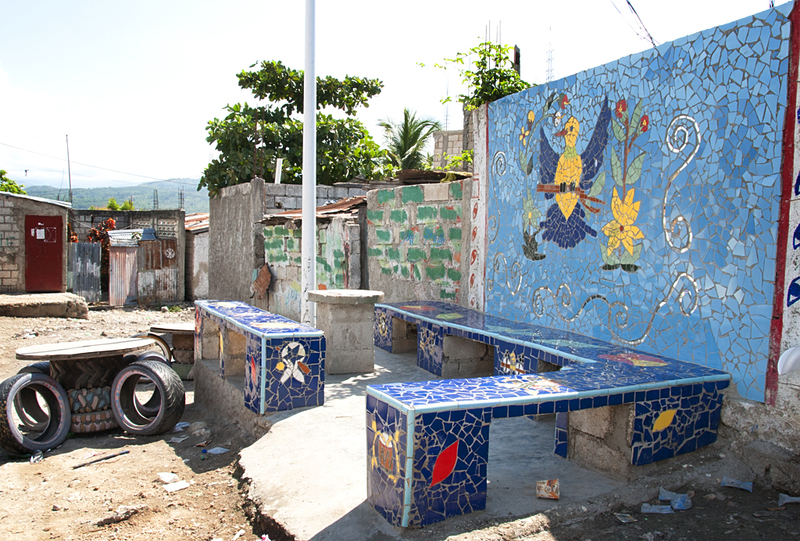 A cement bench was covered with tiles and instantly became a gathering place. 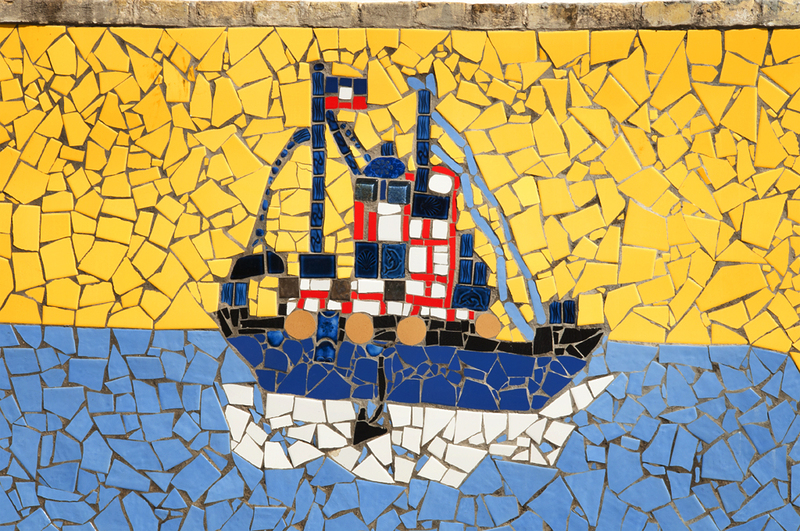 The entire town celebrates this work and the wall has become a place of great pride. I love its fanciful nature – childlike, beautifully executed.